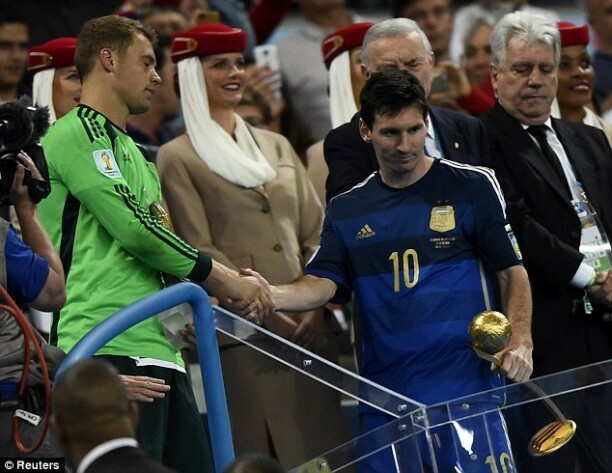 Despite a heartbreaking loss in the World Cup final, Lionel Messi is still a golden boy. The soccer star and captain of the Argentina national team was awarded FIFA‘s Golden Ball award as the best player of the FIFA World Cup after leading his team to Sunday’s final. Germany goalkeeper Manuel Neuer, who kept a clean sheet as his side beat Argentina 1-0 in extra time at the Maracana to claim their fourth World Cup, was awarded the Golden Gloves as the tournament’s top keeper. “It is a sad prize that I won because we wanted to lift the trophy for Argentina,” Messi said of his consolation prize, as if the look on his face had not already said it all. Four-times World Player of the Year Messi had a quiet game by his standards on Sunday but was the driving force behind Argentina’s push to their first World Cup final since 1990. 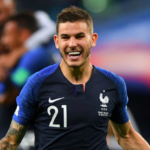 He scored four of their six goals in the group stage, set up Angel di Maria‘s winner in the last 16 against Switzerland and shouldered the burden of slotting home Argentina’s first penalty in their shootout win over the Netherlands in the semi-finals. “I think Lionel reached the pantheon of the greats a while back,” Sabella told reporters. “Yes, I think he deserved it. He played a great World Cup to get us where he did. FIFA also praised their positive play and the behavior of their players and officials.